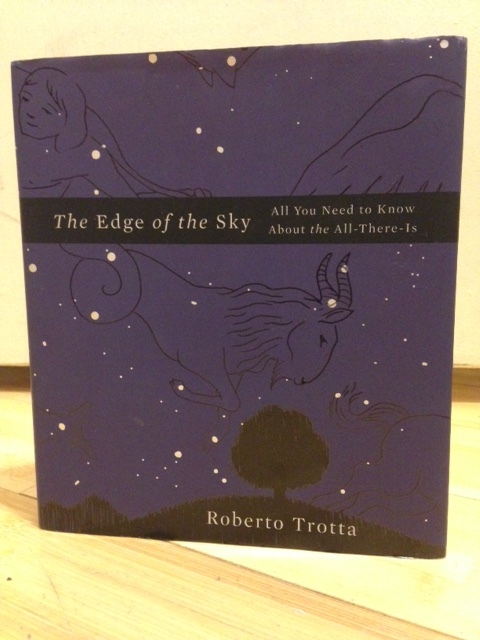 I have mixed feelings about “The Edge of the Sky” by Roberto Trotta. The book is about astrophysics: planets, galaxies, dark matter, relativity, the Big Bang, etc. But it’s not your typical science book; Trotta wrote it using only the 1,000 most common words in the English language. The idea is that everything should be explainable in simple terms, and a notoriously complicated subject like astrophysics is no exception. The final result, in my opinion, was that depending on your level of subject knowledge you could learn a little bit, or spend the whole time trying to piece together which words and explanations corresponded to which astronomical objects and theories. For example, the 1,000 word restriction forced Trotta to write the “Sun’s Sister,” instead of the “Moon.” Most people probably know what the Moon is, and by calling it the Sun’s Sister, I had to pause and think about what that could be. There are a lot of these types of proper names (White Road for Milky Way, Sister Drops for Dark Matter) and even though the words themselves were simple, I felt like I was trying to learn a whole new list of terms in a new language. The result was that I had to stop reading every few lines and decipher what the author was alluding to – I would then forget where I was and have to start the section over again. I am not an expert in astrophysics, but I may know more than the average person. As such, I can’t judge how well a beginner would learn from this, or a child – I could be entirely wrong, and a beginner really would learn a lot from this book. This is why I’m hesitant to say I don’t recommend “The Edge of the Sky;” I don’t feel able to make an educated guess about how other people would receive it. But another reason is because the book’s premise is in line with something that astrophysics (and all the sciences, really) sorely need: simple, fun explanations. Being an aspiring science writer, I care a lot about how science is written about and explained. I consider creativity to be the key to promoting science love and learning among non-scientists, and this book was certainly creative. This entry was posted in Book Reviews, Science Books and tagged Astronomy, astrophysics, book review, books, nonfiction, space. Bookmark the permalink.